Comments: Comments Off on Personal Memories of Baseball. I have to admit that I am a fan of losers. In the MLB I follow the Indians and the Cubs. Today the Cubs come to Cincy to play the Reds in a day/night double header. For years the Cubs came to play the Reds in a traditional double header right around the All-Star break. It was also around my birthday (and no I no longer recognize those). My Dad would take a day off from managing the family business. We would go to see the games and go out to dinner. The games were at Crosley Field. It became a great tradition that we looked forward to every year. Please share your favorite baseball memories with us as well. Comments: Comments Off on Don’t expect the NFL Draft to move back to April anytime soon. Don’t expect the NFL Draft to move back to April anytime soon. The NFL owns August through early February by virtue of the season and playoffs. It owned March and April with free agency and the draft in previous years. This year the NFL used an excuse of the venue being scheduled requiring a move to May 8-10th. That did not happen. Why would any venue, even one as well known as Radio City Music Hall, schedule something to conflict with a hugely popular event like the NFL draft? They wouldn’t. The show that was supposedly scheduled was canceled but the NFL had already set the date for May. Here is the truth. The NFL wanted to take May back from Major League Baseball. The draft is the best way to do that. 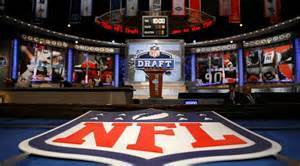 The anticipation prior to the draft will keep sports talk shows talking about the NFL. I am lucky because since NNR started on the air in January of 2011, after week 5 all the Browns fans want to talk about is the NFL Draft. The NFL will also dominate talk for the rest of May due to discussions of what teams did and should have done. The league has stolen May from MLB and has no desire to ever give it back. So MLB has June and July with a little bit of October to call its own. Roger Goodell said yesterday that the NFL is considering making the draft a 4 day event. Due to constraints set upon the league by negotiations with the Union, there will be no more than 7 rounds including compensatory picks awarded by the league for lost free agents. So you have to wonder if the teams will be allowed more time to make each pick. That would allow for more commercial breaks for the NFL network and ESPN between picks. At this point, nothing the league does to increase revenues would surprise me. Major League Baseball has umpires with impaired eyesight refusing to use instant replay. Even when they do they get the call wrong. Now the league faces the biggest drug scandal in its history. The league is being run more by the umpire and players’ unions than by team ownership. Every time the owners have an issue they hide behind the unions as the excuse for not being able to change things. The current collective bargaining agreement provides some fairly stiff penalties for use of PEDs. However, the league needs to regain the confidence of the public. The only way to do that is to give the player a 100 game penalty for the first time he fails a test. The second time he should be banned from the game for life. That should also prevent him from being considered for the Hall of Fame. The issue of inconsistent umpiring is different. The line setters can adjust to players being suspended for PED use. However, they cannot adjust for wildly inconsistent calling of the game. The interest in any sport is in part due to gambling by the fans. The first indication of the impact of bad umpiring will be Los Vegas refusing to put lines on some games. There is a way that the umpires can be brought under control by the owners. The owners should put the computers to use by showing the position of the pitch on the scoreboard. If I had a team, I would put up the percentage of correct calls on the board as well. That should take some of the arrogance out of the Umps. The owners have total control of the scoreboard and should get some guts. The union will scream but someone needs to show the union who is in control. But when the league is run by a wimp like Bud Selig, there is little hope for it. We discussed the Browns draft and previewed the Indians season by analyzing the lineup and pitching. Follow me on Twitter to get the schedule of NNR Special podcasts. At 6:20 Paul Banks of The Sports Bank.net and the Chicago Sports Guru joins me to talk about the NFL CBA, the effects of the shortened off season and the NBA lockout. At 7:20 Richard Vester founder of Victory Sports Agency joins me to talk about what he has heard from the NFLPA about the CBA progress and MLB CBA contract status.